Humans have been placing their deceased loved ones in coffins for centuries. The word "coffin" is ultimately derived from the Greek word ko-pi-na ,(basket) which as a word appeared in manuscripts as far back as 1300 B.C.! In the US, the design has stayed relatively the same over the years, except for that brief time in the 1800's that people were afraid of being buried alive and a crop of "safety coffins" popped up. The same is not true in Ghana, Africa, where for the last 60 years the Ga tribe in the coastal region of Ghana have celebrated an individual's life by designing custom coffins. 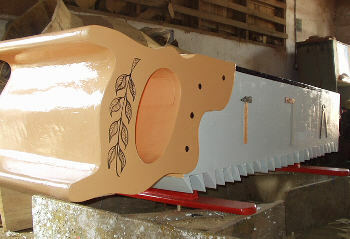 When I say custom coffin I do not mean painting a traditional coffin in personalized colors or designs as the company Colorful Coffins in the UK, or Happy Coffins in Singapore does. Although these coffins are beautiful and individualized, they still hold to the traditional Coffin form. In Ghana, however, "custom" implies bold and different, as a handful of wood workers have created a unique craft, actually molding the wood into individual objects that represent the deceased's life. This can range from a soda bottle, seashell, fish, or shoe to represent an item the person sold for a living. 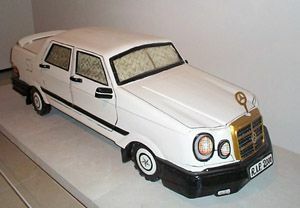 Or the coffin may be a symbol of something loved, like a cigarette, Mercedes, airplane or ice cream bar. 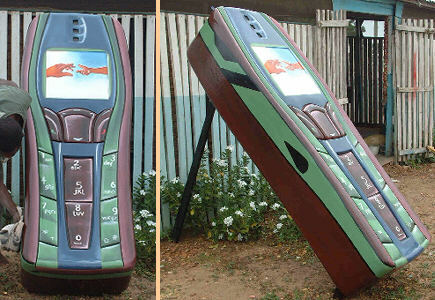 The colorful coffins take weeks to months to prepare and can cost a year's salary for a Ghana resident. If the deceased hadn't planned ahead enough for the coffin to be ready- the body sometimes must be refrigerated the length of time it takes to finish. Other delays can come with family disputes on what item should actually represent the deceased. So, what do you think? Does the idea of personalizing your coffin as the other two companies listed above do, appeal to you? Do you think the idea of a over-sized wooden object as a coffin will catch on in the US? I saw these featured on The Amazing Race this year. They went to Ghana and had to push a custom coffin to a coffin showroom to complete one of the tasks. Thanks for writing this, because that part of the show got me very curious but apparently (for once) I did not have a computer right at my disposal to start searching. I found the store featured in the show. it is called "Hello Coffin"
I am not sure what my coffin/urn should be shaped like but this has me thinking. Unfortunately, if it can be costly and trendy, it will catch on here. I can visualize wealthy Americans offering so much for these coffins that the locals will be priced out of their own market. I am Jewish. A traditional Jewish burial in the US is in a plain pine box - nothing to slow down the return of the body to the soil. In Israel, where it is legal, the body is placed in a white cotton shroud and then directly into the ground.